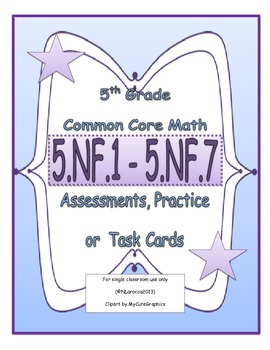 This pack contains 7 assessments for 5NF1-7 which covers the following material. 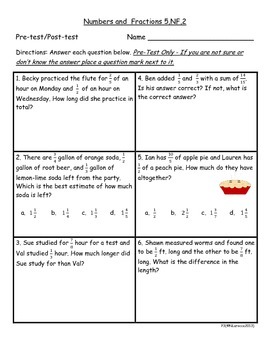 (See list below) If you don’t want to use them as assessments they could also be task cards, a mini assessment, extra practice, scoot activity, or even homework. CCSS.Math.Content.5.NF.A.1 Add and subtract fractions with unlike denominators (including mixed numbers) by replacing given fractions with equivalent fractions in such a way as to produce an equivalent sum or difference of fractions with like denominators. CCSS.Math.Content.5.NF.B.6 Solve real world problems involving multiplication of fractions and mixed numbers, e.g., by using visual fraction models or equations to represent the problem. 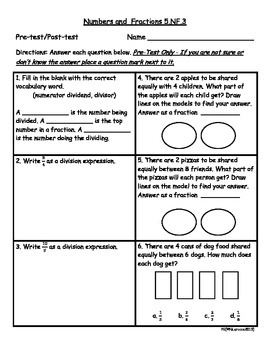 CCSS.Math.Content.5.NF.B.7 Apply and extend previous understandings of division to divide unit fractions by whole numbers and whole numbers by unit fractions. 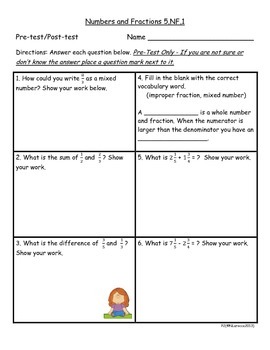 This work is for single classroom use only and all material is copyright to NLarocca2013.